On Monday I was able to get someone to agree to do another public Fat X Project. For those of you new to Fat X 101, a Fat X Project is a run through the Fat X Program. 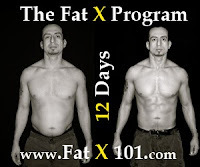 The Fat X Program is a 12 day fat burning workout and diet plan specifically designed to burn fat and get fit fast. Every once in a while, I can convince someone to have me put up their results publicly, in exchange for private training/coaching through the workout program. Why do I do this? Well, I recognize that some people need and extra motivational push to help them get started on a healthy diet and workout program. I've found that showing off the achievements of others on a workout and diet program can be a great motivational tool. So hopefully it will help you either get started on a healthy diet and workout program or continue through one. I started this new Fat X Project on Monday, February 21st, so the last workout should be done on March 4th (hopefully). 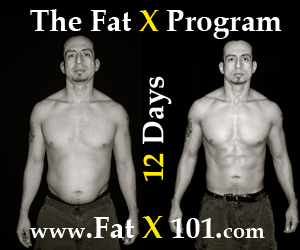 I'll post results soon after as well as more tips and tricks to help you get through the FX 12 diet and workout program. If you would like to start your own project, download the workout manual/guide and follow along with the free fat burning workout videos.